Rolling tool boxes are becoming more and more popular on the jobsite. Workers often have to pick up from one location and move to another, and having wheels makes the process that much quicker and easier. Stanley makes a rolling tool chest that is commonly found on the jobsites and is one that I use, but the features on the Keter Master Pro Sliding Tool Chest have me thinking I need a change. My Dad first noticed the Master Pro Slider at HomeDepot and when he told me about it, I went online to check it out. Though it is branded as the Husky MasterLoader at HD, I later found out that it is made by Keter. My Dad was in need of a new rolling chest after his Stanley box died, so my Mom and I figured the Keter would make a good Christmas present. The main feature that my Dad liked on the Master Pro Slider was the way the lid on the chest separated in the middle to provide access to the larger compartment. 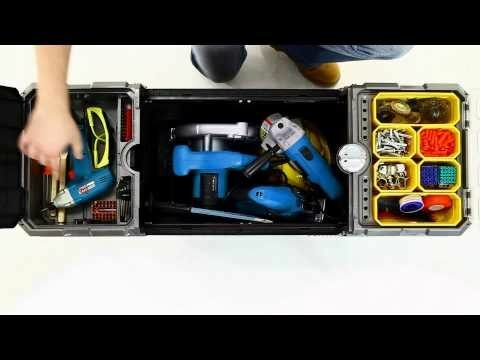 The unique feature solves the problem of where to put the tray inserts that you find in other tool chests and also provides quicker access inside to box. We never expect tool chests like this to be as secure as a gang box, but we do like them to provide some protection if we need to step away for a few minutes while on the job. A cool feature on the Sliding Tool Chest is a central auto locking mechanism that can secure the entire box including the top organizers with a single lock. The build quality on the Keter Slider is surprisingly good. It uses metal drawer glides to move the top sections of the box out of the way, and seem very strong and move smoothly. From the wheels to the handle bar, it feels like a better chest then what Stanley is currently offering, and they both cost around $50. My Dad has been using his on the job since Christmas, so maybe we will see him add a review. Go to http://www.keter.com to see our Master Pro Sliding Tool Chest! Watch and learn how to use the Master Pro Sliding Tool Chest from Keter Plastic! Tool Storage is just that easy!